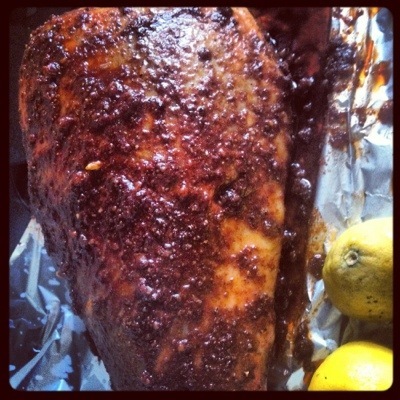 Easiest ever slow cooked Roast Leg of Lamb for Sunday Lunch …. This is a good quick recipe and so easy to make. I am just marinating a leg of lamb for one of our abundant Sunday lunches. It is getting very hot here and I would like to cook something substantial to feed the big appetites without spending too much time in the kitchen. On the island we are blessed with fresh produce and the local fresh lamb is of a premium quality but if you wish to be more economical we can also find excellent frozen lamb from New Zealand which you can leave to defrost overnight before marinating. With the lamb I am serving simple roast potatoes and a Mediterranean Green leaf and tomato salad. Mix the lemon juice and zest, olive oil some finely chopped garlic and a mix of finely chopped fresh and dried herbs of your choice. Add a spoon of sweet smoked paprika. Place the lamb on a large piece of foil and rub the marinade all over. Roughly chop up the onions and spread all over the lamb. Season and if available roughly cut up sprigs of fresh rosemary and put over the lamb. Wrap the leg in foil and leave in fridge at least overnight. I cook mine in a slow oven at 150 C covered for 4 hours and then uncovered for the last 30 minutes. The result is tender, moist delicious lamb that will literally melt in your mouth. 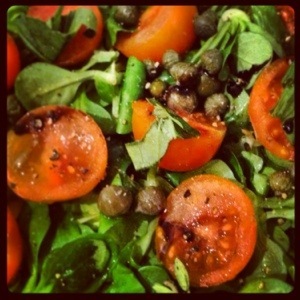 Apart from roasting some potatoes, I will serve a simple Mediterranean Tomato and Leaf Salad. I like to leave it to rest before serving and I garnis it with more fresh rosemary. i prefer to take it as it is to the table or side buffet table on a large platter surrounded by The roast potatoes with a huge bowl of salad by its side and everyone can help themselves. What I call stress free cooking ! Nothing like a big slab of meat to celebrate a Sunday! Looks great! Thank you. Let me know your results when you try it out!